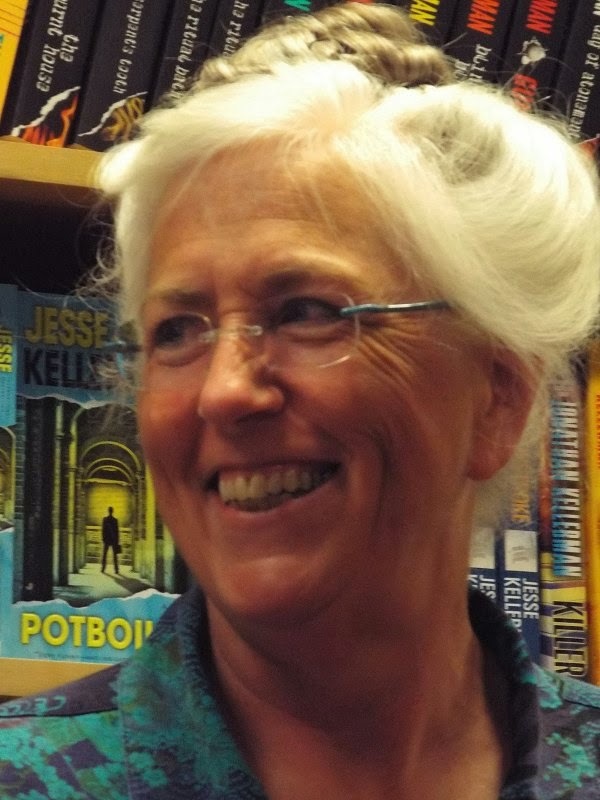 Talking British Classic Crime with Laurie R. King at The Poisoned Pen! Thursday night at The Poisoned Pen was something special. To celebrate Poisoned Pen Press being the British Library Crime Classics publisher in the United States, Barbara Peters and Laurie R. King planned an evening of tea, yummy refreshments (I love lemon curd), and lots of talk about the Golden Age of British crime fiction. It was a packed house, so Denis and I weren't the only ones who couldn't resist! We got there early-- as usual-- and we were in for a treat because the woman I'd talked books and Scotland with at the signing for Susanna Kearsley arrived. No reading for us; we sat and talked and talked and talked. Kathy (yes, that's her name!) had two planned trips to tell me about, and it almost made me wish that our own trip time would hurry up and get here. Before the official start time, Barbara told us about the many restaurants that are within walking distance of the bookstore-- which is the main reason why The Poisoned Pen doesn't have a café or coffee bar of its own. After telling a hilarious yet painful story about a patron from one of those nearby restaurants, Barbara told us, "I don't mind if you bring in your beer when you come to one of these events, but if you spill it on anything, it's yours!" 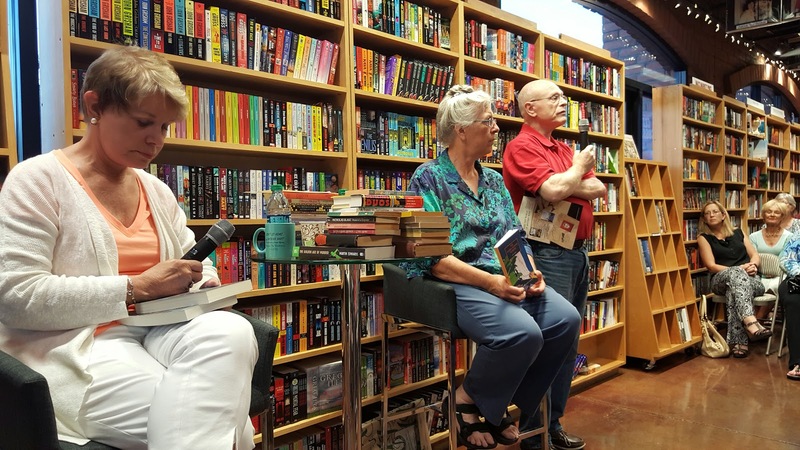 The next item up for discussion was the "Death on Demand" event at the bookstore in honor of author Carolyn Hart's 25th Death on Demand mystery, Don't Go Home. On Saturday, May 9, Carolyn will be joined by Kate Carlisle, Hannah Dennison, Laura DiSilverio, Judith Janeway, and Jenn McKinlay, with Katherine Hall Page attending via Skype. They're creating the Death on Demand Mystery Bookstore inside The Poisoned Pen. There will be lots of food, contests and prizes, and I wouldn't be surprised if the crowd winds up overflowing into the parking lot. Naturally I intend to be there to find out! When Laurie King appeared, Barbara told us that Laurie "gave me my only real Oxford boating experience." "Punting," King corrected. She'd already corrected Barbara's pronunciation of "Cherwell," so the evening was off to a fine start. Laurie's eyes were twinkling; it is so obvious that these two women are good friends. Oh, you're still wanting to know about the River Cherwell? The proper pronunciation is CHAR-well, like "charcoal." Robert Rosenwald, president of Poisoned Pen Press (and husband of Barbara) spent a few minutes telling us how he was asked two years ago if Poisoned Pen Press would like to be the American publisher of the British Library Crime Classics series of books. These books were originally published in the 1920s and 1930s, and many have been out of print for eighty to ninety years. As far as Rosenwald was concerned, this was a perfect fit. He wants to make as many books like this available over here in the U.S. as possible. Books in this series that will be released in June are Capital Crimes and Resorting to Murder, both short story anthologies. 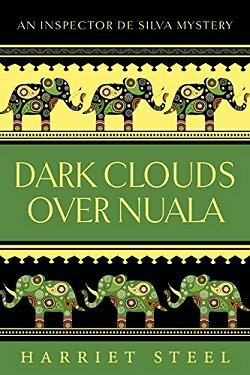 All the books will have introductions by Martin Edwards which is something to look forward to in and of itself, and I was thrilled to learn that Edwards has a new Lake District mystery coming out this fall. After mentioning that there would also be a line of spy novels published, Barbara began sorting through the stacks of books she'd put on the table. While she was sorting, Laurie told us that she'd read John Bude's book, The Sussex Downs Murder, more or less as research for her own Mary Russell books. "Bude wrote with a very clear sense of time and place. As a writer looking for books actually written in the time period, to find someone like Bude almost feels like cheating," King told us. Holding the book up to show us, she continued, "A mystery today would be at least one-third thicker. Modern readers have much different expectations. Mysteries written during the '20s and '30s are a really pure form of detective fiction. Back then if something wasn't necessary to the story, it wasn't put in." Looking up from her mini-gold mine of mysteries, Barbara exclaimed, "DNA has absolutely ruined the 'missing heir' plot in crime fiction! It's such a shame. I love books like Josephine Tey's Brat Farrar." Peters then began to share the jewels she'd brought from her personal library. 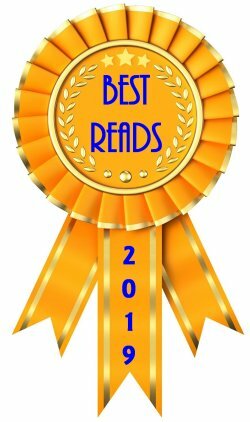 I'm just going to mention a few authors here. Michael Innis. Nicholas Blake. Edmund Crispin. Christianna Brand's Green Is for Danger caught my eye, especially when Peters told us that author Robert Barnard took a cue from Brand whenever he didn't want to go into the details of an investigation, using her "and the police pursued their meticulous investigation" so he could go on to write more interesting parts of the book. "Have you noticed that there are only a few judges who've written mysteries?" Peters asked. "Judges don't like to be reviewed. Cyril Hare was a judge, and his Tragedy at Law is a 1930s version of Scott Turow's Presumed Innocent. 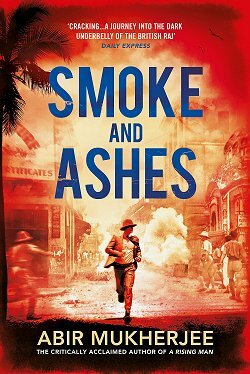 "And Marjery Allingham's The Tiger in the Smoke is my favorite of her books. It takes place in a London peasouper, and is one of the scariest, creepiest books ever!" One thing that both Peters and King agreed on was that the Golden Age of crime fiction in Britain was very well represented by women, and I'm looking forward to reading some of them through the British Library Crime Classics. Talk of the Detection Club ended the discussion of this period of mystery writing. The club was founded in 1930 for crime writers to get together to socialize. Members must be elected. Martin Edwards was elected, and in 2011 he was appointed the Club's first archivist. There's a lot of "dirt" on the Detection Club in Edwards' The Golden Age of Murder, which is one of the reasons why I want a copy. The Detection Club also has something known as "Father Knox's Rules," two of which are (when writing): No Twins and No Chinamen. Although those two rules may sound a bit bigoted today, they are meant to be against plot conventions-- especially those of the 1930s. The members of the Detection Club couldn't get stuck while writing a book and bail themselves out by blaming it all on the evil twin or the mysterious Chinese man. Both women have attended meetings of the Detection Club. Peters told us of a very boring Club meeting in which she ducked out of the room to go to the restroom. She then spent a wonderful thirty minutes in the pink ladies' room at the Savoy talking with P.D. James. King spent the night on the Detection Club premises-- in the library! She spent the entire night reading her way through as many of those marvelous books as she could. In the morning as she was leaving, she asked the man escorting her, "You put me in the library. Aren't you going to frisk me?" 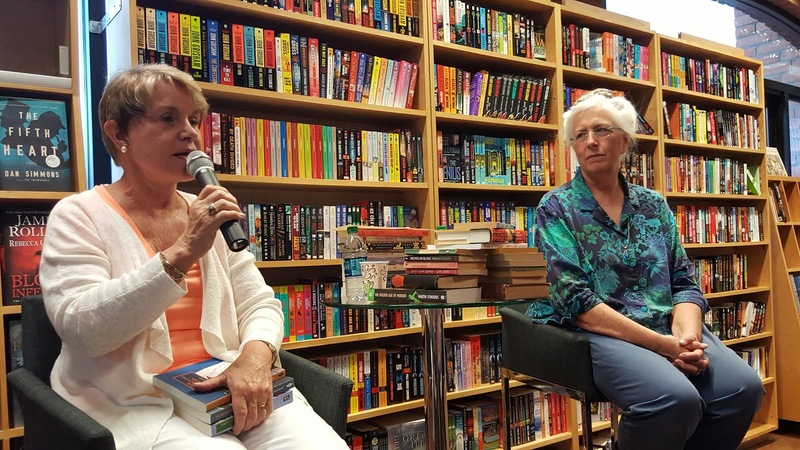 Yes, there were a few minutes spent talking of King's book Dreaming Spies, and both women talked of their joint book Not in Kansas Anymore, TOTO, but those topics were covered in a previous King appearance at my favorite bookstore. Tonight most of us were there to learn more about classic British crime fiction and to be entertained by these two erudite women. 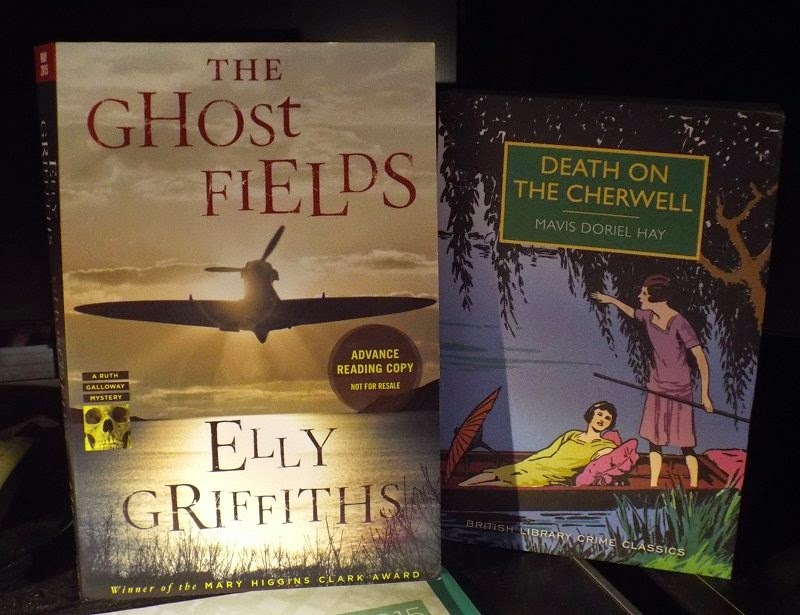 As the evening came to an end, I already had a big smile on my face, but when several books were given as prizes to those attending and Barbara Peters handed me an advance reading copy of Elly Griffiths' The Ghost Fields, I came this close to breaking into a happy dance. Fortunately for all those standing in my vicinity, I restrained myself. These two came home to Casa Kittling. I adore Ruth, I would have broken into a happy dance no matter what. I wish I could have gotten in to the Laurie King books but frankly the beekeepers apprentice put me to bed every time I would pick it up. I know she is insanely popular and I alway think I might revist it but I still think of that first book. What a lovely evening this was, Cathy! And a nice sort of theme for it too. Glad you enjoyed it so much. Thank you so much for telling about this event! I loved reading about it. First of all, yay for The Ghost Fields. Then, I've seen those new publications that PP is doing and wondered about them - the classic ones I mean. Good to hear some backstory. Saw something about the Martin Edwards' Golden Age of Murder. Think I will require that as well. And you really must go to the event this weekend. I also require a 'spy's eye' view of the Death on Demand event. I so wish I could be there. Carolyn Hart is a longtime favorite of mine and though I am behind on reading those books, I saw her at Lesa's library a few years ago. I felt like a major fangirl. And she was with Earlene Fowler, who I have also read for so many years. I think I gushed - a lot - to both of them. I think I understood that this may well be the last time Carolyn tours for a book. So glad I got to meet her that time. Enjoy it! According to Barbara Peters, this will be Hart's last tour. You are so lucky to have such a wonderful book store near you. We have none, not even a used bookstore. Savannah has book chains but no independent ones that I know of. I ordered Ghost Fields from Amazon UK I couldn't wait for it to come out here. Oh, gosh, I'm almost doing the happy dance about reading about this evening and the discussion's high points -- and that you got a copy of the newest Ruth Galloway book. I'm green with envy. I check the library catalogue every day looking for The Ghost Fields. That little aside about Robert Barnard made me smile. had time, I would. I loved her Kate Martinelli series. That aside about Barnard made me smile as well, Kathy. 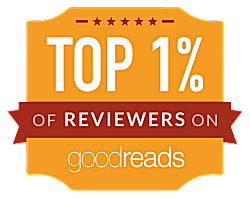 I avidly await your review of The Ghost Fields. That might push me to buy a copy, but I am trying to hold out for a library copy. Here's a sneak peek of my review: It's getting an A+.